Adenine nucleotides are major determinants of the energy status of the cell. Thus, any modulation of their cellular concentration can have significant consequences to cellular metabolism, cellular growth, and cell death. Many biochemical reactions that generate adenosine monophosphate (AMP) as a reaction product are pivotal players in a variety of signaling pathways and thus are considered validated drug targets. These include enzymes involved in protein ubiquitination (ubiquitin ligases), protein synthesis (aminoacyl tRNA synthetases), second messenger signaling (cAMP-phosphodiesterases), and DNA synthesis and repair (prokaryotic and eukaryotic DNA ligases). In the search for selective modulators and the development of novel therapeutics, an assay to monitor the activity of these enzymes is desirable. As AMP is a common product of these enzymatic reactions, the development of an assay that monitors AMP in a homogeneous and sensitive fashion is expected to have significant impact in these diverse areas of research. In addition, enzyme reactions that generate products that can be converted to AMP can be also monitored using this assay. The newly developed bioluminescent AMP-Glo™ Assay from Promega is performed in two stages after the completion of an AMP-generating reaction. The principle of the assay is illustrated in Figure 1. Figure 1. Principle of AMP-Glo Assay: The AMP-Glo Assay can be used to detect activity of enzymes that catalyze any reaction producing AMP as a reaction product, including enzymes that do not use ATP as a substrate (e.g., cAMP-specific PDE, poly(A) deadenylases, ribonucleases, bacterial DNA ligase) as well as enzymes that use ATP as a substrate (e.g., ubiquitin ligase, aminoacyl tRNA synthetase, eukaryotic DNA ligase, succinyl CoA synthetase). After completing the enzymatic reaction, adding AMP-Glo™ Reagent I terminates the reaction, removes any remaining ATP, and converts AMP to ADP. Adding AMP Detection Solution drives the conversion of ADP to ATP and the detection of ATP through the luciferase reaction. The amount of AMP produced by the reaction is proportional to the light measured and can be extrapolated using a standard curve. In the assay, the amount of AMP produced by the reaction is proportional to the light measured, which can be extrapolated using a standard curve (Figure 2A). Reactions that use ATP as a substrate to produce AMP, such as ubiquitin ligases, require the removal of residual ATP before converting AMP to ATP; reactions that do not use ATP as a substrate, such as cAMP-dependent phosphodiesterases, do not require this step. Thus, enzymatic reactions of the latter type can be combined with the step of converting AMP to ADP. Figure 2A shows the standard curves generated for up to 10µM AMP simulating enzymatic reactions generating different amounts of AMP, with or without ATP as a substrate. The signal to background ratios (SB) resulting from the AMP concentration are also shown. This assay is capable of detecting low AMP production, to less than 30nM AMP without ATP and approximately 150nM with ATP present. The AMP-Glo Assay is sensitive to low AMP concentrations and the luminescent signal, reported as RLUs, is linear with increasing AMP amount. The assay is robust as indicated by the Z’ value (greater than 0.8) and is also less susceptible to false hits (Figure 2B). During a screen of 1,280 compounds of the LOPAC library performed using the AMP-Glo reagents in the presence of AMP, only three compounds altered luminescence by more than 80% indicating that the AMP-Glo Assay is resistant to chemical interference and is highly suitable for HTS. Figure 2. (A) Linearity of the AMP-Glo Assay: AMP was titrated in the presence or absence of 100µM ATP. The table shows the sensitivity of the bioluminescent AMP detection. Signal to background ratios are high at low levels of AMP. (B) Screening AMP-Glo reagents for false hits using LOPAC Library: Reactions containing AMP-Glo reagents to convert AMP (10µM) to ATP were tested in the presence of 1µM of each of the 1,280 compounds comprising the LOPAC library and were processed following the two-step protocol. Compounds that alter the luminescence output indicate alteration of either the luciferase reaction or the reactions converting AMP to ATP. Because AMP-Glo detects AMP production, it is capable of detecting the activity of a wide range of enzymes that produce this nucleotide. Furthermore, many enzymes generate products that can be easily converted to AMP, for example, SAH generation by methyltransferases, and they can also be monitored using this assay (data not shown). 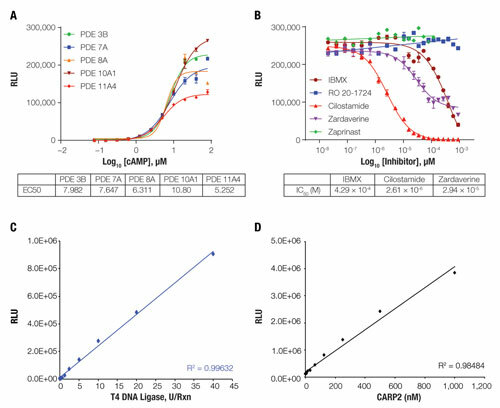 As shown in Figure 3, the AMP-Glo Assay was used to monitor the activity of three drug target families, cAMP PDEs, DNA ligases, and ubiquitin ligases. We also show that this assay can be used to generate dose response curves for inhibitors against these targets. Figure 3B shows that PDE inhibition with different drugs can be monitored using the AMP-Glo Assay and the IC50 values generated are similar to published values. This demonstrates the universality of the assay and its capability in monitoring any enzyme reaction that produces AMP regardless of the nature of the second substrate. Thus, this assay offers an advantage compared to other nonradioactive assays—it is not necessary to modify or label either the substrate or the reagent needed to capture or monitor the product. As many AMP producing enzymes are becoming good candidate drug targets, there is a strong need for tools to monitor their activities. Here we show that the AMP-Glo Assay can be used in any stage of these enzyme characterizations. In addition to studying the biochemical regulation of these enzymes, this assay can also be used to screen for inhibitors and study their modes of action. Figure 3. 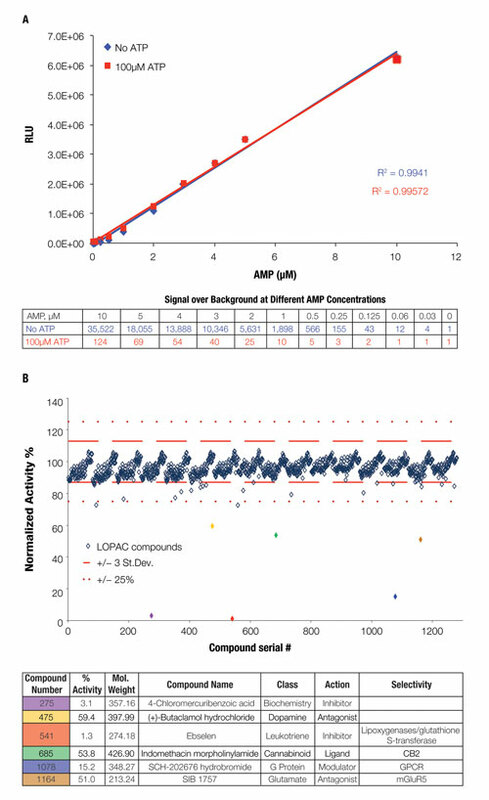 AMP-Glo detects the activity of diverse AMP-generating enzymes: (A) cAMP titration in different cAMP-dependent PDEs analyzed with AMP-Glo Assay. (B) Inhibitors dose response on PDE 3B enzyme. AMP-Glo assay detects cAMP PDEs activity modulation in response to drug treatment. (C) Detection of bacteriophage DNA ligase through detection of AMP produced. (D) Detection of E3 ubiquitin ligase activity with AMP-Glo Assay. Said A. Goueli, Ph.D. (said.goueli@promega.com), is research fellow, Kevin Hsiao is senior research scientist, and Hicham Zegzouti, Ph.D., is senior research scientist at Promega.